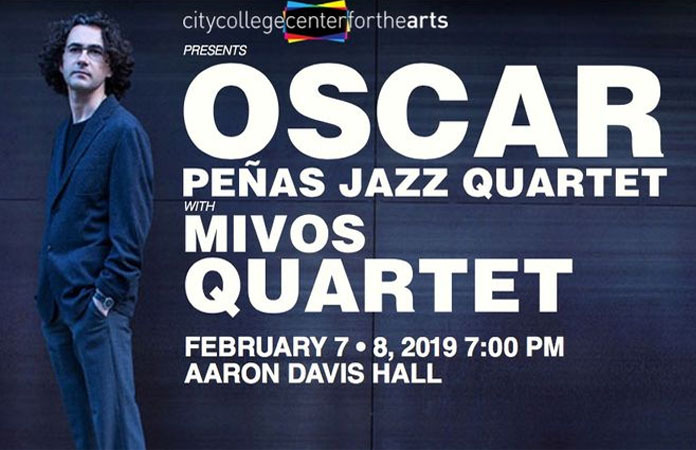 New York (January 22, 2019) — Spanish-American guitarist Oscar Peñas will bring his newest musical oeuvre Almadraba to Aaron Davis Hall for two concerts presented by City College Center for the Arts (CCCA) at 7 p.m. on Thursday, February 7, and Friday, February 8. A fascinating mix of the jazz and classical worlds, the Almadraba suite performed by the Oscar Peñas Jazz Quartet joined by the Mivos Quartet string ensemble offers a tribute to the musical milieu in which Peñas was raised and a classic Spanish fishing tradition. Almadraba, Peñas’ suite of original compositions inspired by and named for the technique of capturing bluefin tuna practiced in the Andalusian region of Spain for more than three millennia, will reel audiences in. A 12-part suite, the work reflects his Iberian heritage and his masterful ability to blend those roots with jazz, classical melodies and the music of Latin America. Pieces in Almadraba include “Traveling Through Water,” an ode to the journey of the fish toward the warm waters of the Mediterranean; “La Levantá,” whose energetic melodies flow in accordance with the arduous labor of the fishermen, or almadraberos; and “Calamento,” named after the intricate, maze-like process of staging the nets needed to ensnare the fish. A studio recording of Almadraba is currently in the works and will be released at a later date on Peñas independent music label, Musikoz. “If Almadraba can musically transport CCCA’s audience to the magnificent coast of Cadiz, my mission as a composer will be accomplished,” said Peñas. The Oscar Peñas Jazz Quartet includes Peñas (guitar), Marta Sánchez (piano), Pablo Aslan (upright bass) and Richie Barshay (drums/percussion). The Mivos Quartet features Olivia De Pratio (violin), Maya Bennardo (violin), Victor Lowrie Tafoya (viola) and Tyler J. Borden (cello). Tickets are $20 general admission and $10 for students and seniors with valid ID and can be purchased online at www.citycollegecenterforthearts.org or in person at the Aaron Davis Hall box office Tuesday through Friday from noon to 6 p.m. For more details, visit the CCCA site or call the Aaron Davis Hall box office at (212) 650-6900. Aaron Davis Hall is located on the campus of the City College of New York, at West 135th Street and Convent Avenue (129 Convent Avenue). Follow City College Center for the Arts on Facebook, Twitter or Instagram at @ccnyarts. About the artist: Oscar Peñas is a native of Spain who now calls New York City home. His blending of two genres that may seem antagonistic like jazz and classical, along with the usage of non-traditional instrumentation in either style. Traditional popular folk music from different cultures and sounds from his Iberian heritage meld with an American jazz base. He uses his unique skills to arrange, produce and perform his compositions in many of the best venues in the U.S. including the BAM Next Wave Festival, the Kennedy Center, Jazz at Lincoln Center-Dizzy’s Club Coca Cola, the Philadelphia Museum of Art, BAMcafé, and more. Internationally, he has performed at Teatro Martí in Cuba, the Concert Hall Jamboree in Barcelona, Spain, and at Duc des Lombards jazz club in Paris, France. More information on Peñas and his work can be found at www.oscarpenas.com or by following him on Twitter and Instagram at @oscarpenasjazz. About the City College Center for the Arts: The City College Center for the Arts hosts an ambitious, year-round calendar of student and professional performances. The mission of the City College Center for the Arts is to provide a creative arts center and focal point for the City College of New York, building a sense of community within the College, elevating the profile of Aaron Davis Hall in the greater New York area and connecting the College to the surrounding community through the arts.